The ceremonial lighting of the menorah, when the stars appears, has brought families together during the Festival of Lights since ancient times. Metal and Glass are both very important materials in our work and over time our artists have created many unique forms & techniques for combining these materials. 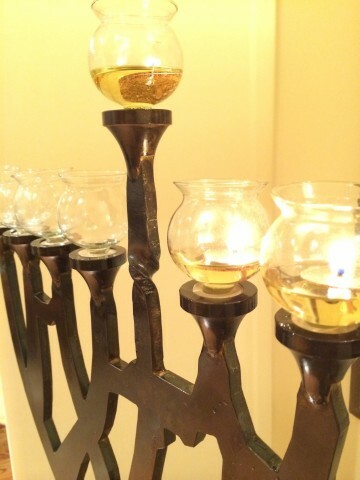 This very unique custom-made piece is cut from of 3/8� thick carbon steel plate cut to the beautiful shape of Hanukkah Menorah. The oil glass holders are carefully machined to a curved steel shape & then welded to the structure. The �Shamash� (center light) is twisted to resemble a Shofar. The gorgeous finish is a hand made acid blend to create this antique, rustic and natural look. The menorah, designed by Y. Eini, also includes the word SHALOM in Hebrew, the map of the state of Israel and the Star of David. The Menorah will be custom crated, at no cost to you in our artisan studios, and shipped anywhere in the continental United States.